Posted by Iris Yan on 4/13/2019 5:03:55 PM. People love listening to audiobooks nowadays. Among so many audiobook vendors, Audible.com must be your first choice because of the 180,000 titles, the great narrators and big discounts. As a coin has two sides, you will also find the Audible employs the DRM scheme to restrict their audiobooks to playing on very limited players. As a real lover of audiobooks, that’s really intolerable. How to break through the DRM restrictions and play your purchased Audible books at any player as you want? 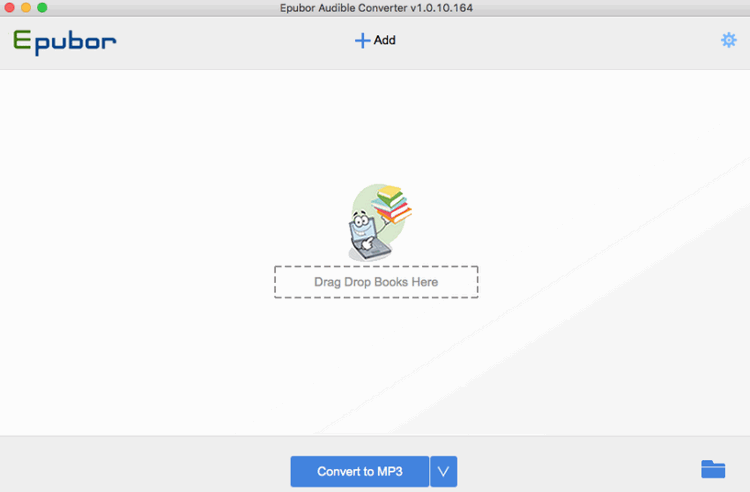 In this article, I will introduce the easiest way to convert Audible AAX to MP3 on Mac. That is converting AAX to MP3 on Mac with Epubor Audible Converter. Why Choose Epubor Audible Converter? Easy to use—With the neat interface, users do not need any complex guide to learn how to use the software. Batch conversion—Have more than one Audible book on your computer? Just add all of them to the Epubor Audible Converter because Epubor Audible Converter can handle Audible audiobooks in batch. Various output formats—Epubor Audible Converter enables you to convert the audible aax/aa to MP3 or M4B. Easliy split audible books—Epubor Audible Converter enables you to split audible books in time, by chapter or into segments averagely as your requirment. How to Convert Audible AAX to MP3 on Mac? Run Epubor Audible Converter at first. Then drag and drop the Audible AAX audiobooks to the interface of Epubor Audible Converter. Or just click on "+Add“and navigate to the folder stored your downloaded Audible files for adding. If you want to split your audible books in time, by chapter or into segment averagely, just click on the "option" icon and the select the way you want to split and click on "OK". If you want to apply this split option to all audible books, just tick the check box before "Apply to all" and then click on "OK" button. Select MP3 as the output format and then click on "Convert to MP3" button at the central buttom of the interface. The Epubor Audible Converter will start to remove DRM from audible book as well as convert audible books to MP3. It combines decrypting and the conversion as a whole. When the conversion has been finished, you will see the "Succeeded" at the end of each title. At the same time, the folder stored the converted audiobooks will pop up automatically. You can also click on "Output folder" to open the folder holding your converted MP3 audible books. Now you have the converted MP3 audiobooks. You are free to play it at any mp3 supported player. 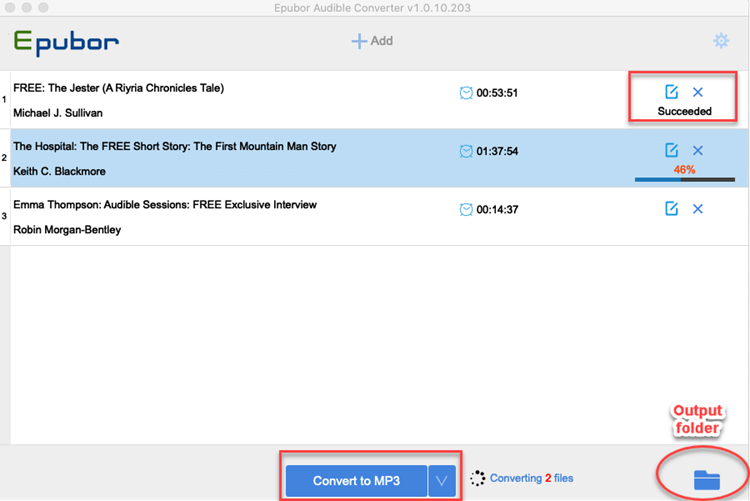 Want to know how to convert Audible aa to mp3? please read The Official Guide to Convert Audible to MP3. 1. If you were from Germany, you can read this article in German AAX zu MP3 Konvertieren. 2. If you want to convert aax to mp3 on Windows 10, you may be interested in this article How to Convert AAX to MP3 Windows 10.